The theme of the influence of Antiquity on the art of the second half of the 18th century, what is commonly called Neoclassicism, is treated often. 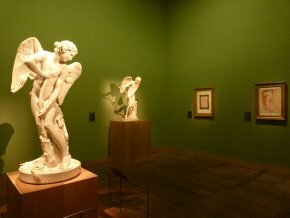 This does not however detract from the fact that the exhibition at the Louvre is a resounding success, both in the understated but very elegant presentation (ill. 1) as well as in the quality of the works on display. Most importantly, it even sheds new light on the subject. Given also that the catalogue is remarkable in every way, with excellent essays, notably that of Marc Fumaroli, and complete entries explaining the context of many of the objects, we can say that this is one of the most outstanding exhibitions of the last few months. The visit begins with works from the period 1720-1730 in order to prove that the taste for Antiquity did not begin in the second half of the century as is often said but goes back much further. 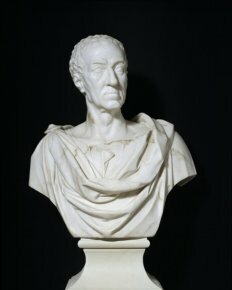 Sculptors like Michael Rysbrack in England or Edme Bouchardon in France rediscovered Antiquity and reinterpreted it, either directly from Greek and Roman examples (Bust of Daniel Finch by the first and that of Philipp von Stosch by the second – ill. 2 and 3) or through the Renaissance as in Amor Carving his Bow in Hercules’ Club inspired from a Roman replica of one of Lysippus’ works representing the same subject (ill. 1) but also from Mannerist engravings after Parmigiano. During the second third of the 18th century some artists then looked more to art of the antique, a return to cultural sources for which writers such as La Font de Saint-Yenne and Winckelmann soon elaborated a theory and encouraged by collectors like the Count of Caylus. 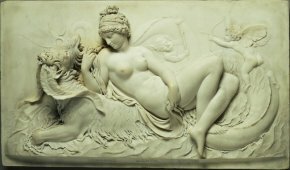 Whereas antique sculpture and architecture represented the models which inspired artists after 1750, the exhibition and the catalogue both remind us that the same did not apply to painting. The remains of frescoes rediscovered then were not of the same quality and they could not be used directly as an example. It had to be corrected through the prism of sculpture and of Renaissance painting, notably that of Rapahel. Although Winckelman was pivotal in helping to spread these antique models, his apology of Anton Raphael Mengs’ art is disconcerting. While some of Mengs’ works are quite honorable , by and large he remains an artist of uneven quality. 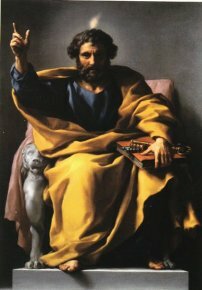 The exhibition presents one of his best works , a Saint Peter (ill. 4) held in Turin, a powerful plastic piece, but which paradoxically is in total opposition to Winckelmann’s aesthetics and alludes much more to Baroque art, notably that of Bernini, as the catalogue so wisely observes. The development of Neoclassical painting was not of course accompanied only by masterpieces. One of its first manifestations, The Love Merchant, which was a reinterpretation of an antique painting by Joseph-Marie Vien, is not really much more accomplished than Mengs’ works. 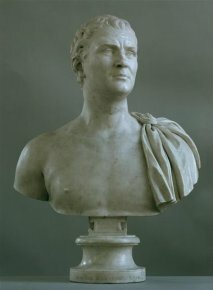 A short essay by Guillaume Faroult, highlighting historical painting and its renewal in the period between 1760-1780, recalls Nicolas Poussin’s importance in such canvases as Eudamidas’ Testament (ill. 5 ; present in the exhibition), which was widely known due to a 1747 engraving, and The Death of Germanicus (Minneapolis) held in Rome at that time and familiar in England. By underscoring the role of certain paintings by Gavin Hamilton, Benjamin West and Nathaniel Dance, the exhibition also confirms the importance of English art in the rise of Neoclassicism which we often tend to attribute, in a chauvinist way among art historians, to David alone. 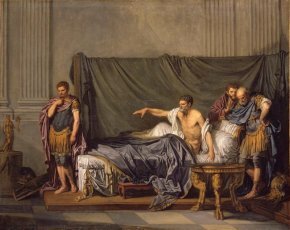 The Caracalla (ill. 6) by Greuze, from 1762 was also an important milestone but poorly accepted and barely welcomed by his contemporaries. Another one of the exhibition’s contributions, which is sure to be hotly debated for some time and will probably mark an epoch, is the creation of no less than two new movements in art history, which as in the case of any category, should be seen as a tool for interpreting, providing further aid in clarifying an otherwise complex situation. Indeed, it is obvious that there are contradictory currents in the painting of the second half of the 18th century, at times found together in the same artist, or even in the same painting. These do not correspond exactly to a strict Neoclassicism, and at times even negate it. Of the two, the notion of “Neobaroque” is the more attractive. The catalogue authors classify such artists as Louis Lagrenée, Etienne-Maurice Falconet, Lambert-Sigisbert Adam, Louis-Jacques Durameau in this category. The proximity to what is generally called Rococo is obvious, as are the differences : Neobaroque is really a resurgence (at times an extension since there is no possibility of continuing) the great 17th century Baroque movement, whereas Rococo is almost a feminine, more vaporous and amorous, version. The Miracle of the Ardents by Gabriel-François Doyen  is typical of the latter. The exhibition presents other examples of paintings classified as Neobaroque but by artists whose aesthetics are usually very different, be it Goya (ill. 7) or Jean-Honoré Fragonard whose Coresus and Callirhoe (ill. 8) is shown here as a symbol of this “new” movement, perhaps true for this canvas but a bit exaggerated in our opinion for the rest of his work, which to us falls essentially under Rocaille art. The other “Neo” art movement created by the exhibition is “Neomannerism”. This second attempt is not quite as convincing and can only be applied, we feel, to certain works, not an artist’s entire production. This description however seems to correspond perfectly to some furniture (see the essay by Christophe Leribault), some sculptures including John Deare’s Marine Venus (ill. 9) or Guillaume Boichot’s Naiad, even certain paintings like the very beautiful Poetry by Julien de Parme with subtle mauve shades, or the paintings and drawings by Guiseppe Cades displayed here, and designated almost as the leader of this new current. But it would be dangerous to draw truths from a few examples. 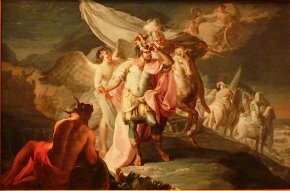 For instance, we were not convinced by the inclusion of Pompeo Batoni in this movement, even in the case of Thetis Entrusting Chiron with Achilles’ Education. To be totally thorough, we should mention a third movement which the exhibition organizers see as a resistance to a strictly observed Neoclassicism, but which is not as new in its individualization as Neo baroque or Neomannerism. This is the “Sublime”, according to a theory developed by the Irish philosopher Edmund Burke in his A Philosophical Enquiry into the Origin of our Ideas of the Sublime and the Beautiful published in 1757 in London. 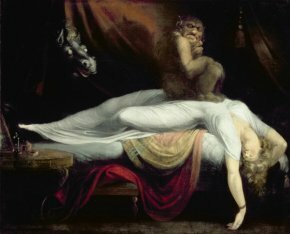 This current which marks in essence the birth of Romanticism incorporates such artists as Johann Heinrich Füssli, William Blake, George Romney and John Flaxman. 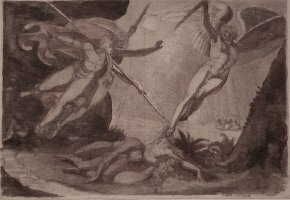 We will list only the most striking works, as for instance James Barry (seen recently at Versailles in the exhibition De la scène au tableau – see article), the famous Füssli The Nightmare (ill. 10) reproduced on the exhibition poster as well as two splendid drawings by the artist, Othar Saving Siritha from the Giant and Satan Starting from the Touch of Ithuriels Spear (ill. 11) as well as Thor Battling Midgard, the Serpent by the same Füssli. 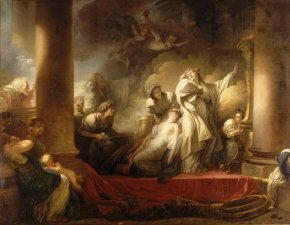 A comparison of this last canvas with the large drawing from the Louvre, in preparation for Satan Exhorting his Legions, one of Thomas Lawrence’s rare attempts at the Gothic genre, is particularly enlightening. We conclude this section with The Fall of a Titan (ill. 12) to underscore how relative, despite being very reassuring, this type of classification is in fact. This sculpture which presents all of the characteristics of the “sublime” and is presented in that section, could just as easily have been included in the Neobaroque current. The artist, Thomas Banks, also produced sculptures which are perfectly Neoclassical, here again proving how just how relative these classifications are. 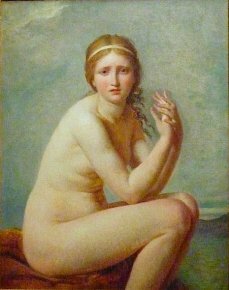 The exhibition concludes by going back to basics, if we may say so, that is Neoclassicism in its strictest manifestation, that of the period between 1770-1790 with Peyron, David, Regnault and Canova. A thematic presentation in four categories (military taste, the celebration of great men, moral subjects and the representation of the human body) seems a bit artificial this time and does not really add anything in the way of ideas. But the works displayed, from a gallery of sculpted portraits to David’s Psyche Abandoned (ill. 13), from a private collection, are all highly interesting. They form a brilliant conclusion to an even more remarkable exhibition. Visitor information : Paris, Musée du Louvre, Hall Napoleon. Phone : 01 30 20 53 17. Open every day except Tuesday from 9 am to 6 pm, evenings on Wednesday and Friday until 10 pm. Rates : 11€ ; entrance with museum ticket : 14€, 6€ after 6 pm on Wednesday and Friday. We point out for example recent museum acquisitions mentioned on this site. 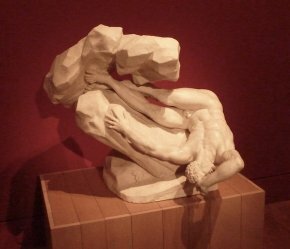 This work was exhibited at the Palais des Beaux-Arts in Brussels in 2009 (see article), a reference which is not mentioned in the catalogue. 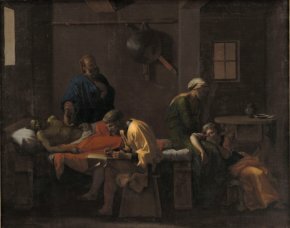 The painting from the Church of Saint-Roch, much too big, is of course not present in the exhibition and is quoted but not reproduced in the catalogue.